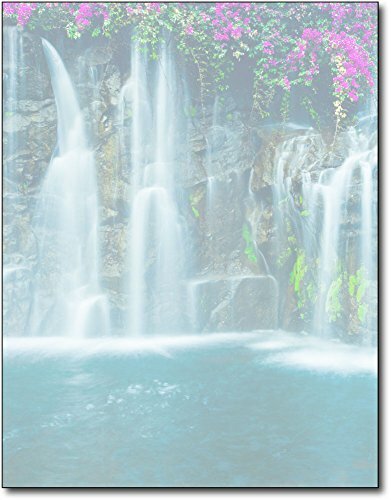 Waterfall Background Stationery Paper by Desktop Publishing Supplies, Inc. is a simple and soothing paper. This peaceful design features a beautiful waterfall surrounded with pink flowers on top and other lush greenery. The design lends itself to spring or summer events and is sure to impress your recipient! This letterhead is made from an above average 28lb Bond paper stock and measures the standard 8 1/2" x 11" size. The design is featured on the front, while the back is plain white. Both sides of the paper are printable with your inkjet or laser printer or copier.